World Wide Waftage - Wafting Through Our World Wide Travels with Ease, Joy and Simplicity: What a great night!...Minnesota Meet & Greet was a great hit!...Thanks to everyone! What a great night!...Minnesota Meet & Greet was a great hit!...Thanks to everyone! Marie and Bill started following us in the beginning of our posts which started in March 2012. It was Marie who inspired the fabulous idea of the "Meet & Greet." Thanks, Marie and Bill! It was wonderful to meet you in person at long last and fun to meet another couple who are "glued at the hip" like us! It couldn't have been a better evening! Our readers came from as far away as Wisconsin with several of our guests driving from distant locations in Minnesota. No words can express how grateful we are for the opportunity to meet and see some of our readers/friends from here in our original home state. Then, there was a handful of wonderful old friends who also showed adding further to the experience of the evening at Grizzly's Wood Fired Grill located next door to our hotel in Plymouth, MN. The restaurant did a perfect job in handling our Reader's Meet & Greet. We'd decided to host the food which consisted of happy hour appetizers and pizzas and leave the purchase of drinks and cocktails to the guests. My friend Chere with me last night with whom I've stayed in very close touch all these years of travel. Grizzly's staff was impeccable in serving the drinks with separate tabs and serving the starters seamlessly in a steady flow as the guests arrived. The food, the service and surprisingly the usually noisy ambiance worked quite well. Prior to the event, we were a little concerned the usual happy hour music would impede conversation but as it turned out, they lowered it a touch for us and we were able to talk without hollering. Earlier in the day, I'd made an agenda for a short presentation but had to toss it to the wind based on the setup and background noise. But, as it turned out, it didn't matter after all. Everyone seemed to have a good time chatting amongst themselves when Tom and I were busy moving about in an attempt to visit with each of our guests. Us with Jodi and her lovely daughter Meredith. Jodi is often included in conversations when we describe our "friend/reader in Minnesota who reads our daily posts on the bus on the way to work each day. Jodi, your generosity was shocking and unexpected. Thank you for your kindness and love. Even we are speechless! It was fun to observe how many of our guests had so much in common with the other guests they'd never previously met. Many went to the same schools, knew each other's friends and had similar experiences. Several in the group are big fan's of Tom favorite radio show, KSTP AM 1500's "Garage Logic." I could hear the laughter when they mentioned the familiar lingo avid listeners have come to know. Many in the group had been following us since the onset of our travels while others joined in along the way. Many had found us based on a local newspaper story about our upcoming travels which was published in 2012, prior to the time we left Minnesota on October 31, 2012. Friends Peggy and Maury, we're so happy you came! Tom and I were reeling from the sheer joy these enthusiastic readers/friends brought to us last night, driving in rush hour traffic with endless detours due to seasonal road construction and for taking time out of their busy schedules to share a bit of life with us. We are humbled by their interest and so grateful to see some of our readers face to face. For those of you in Minnesota who were unable to join us, we appreciate your kind email and Facebook messages expressing your disappointment in being unable to attend. You, too, will be in our hearts as we continue on our journey outside the US on August 1, 2017, in a mere 51 days. Our dear old friends, Lisa and Brian, a wonderful friendship 30 plus years in the making. We're hoping to conduct similar events in other parts of the world down the road including upcoming in Las Vegas on July 21st. (The location is yet to be determined until after we arrive in Nevada on July 7th to check a few possibilities in easily accessible venues). In all, the cost for us (since we always post the cost of everything we do) was $183, including $50 in tips for the helpful staff. Grizzly's prices are reasonable both during happy hour and after. Joanette and Denny. I share low carb recipes with Joanette in Facebook and am thrilled to have them both sharing our journey with us. Joanette surprised me with two of the most delicious chocolate cupcakes I've ever had, all low carb, grain and sugar-free. I ate one last night and will enjoy the second tonight. Thanks so much! The recipe, please, Joanette! After the evening ended and I ordered a salad (none of the appetizers worked for me) and we were on our way back to the hotel, unable to wipe the smiles off our faces for an evening well spent. We apologize to those who's photos we didn't take. Engrossed in lively conversations, we missed several photos ops with others who had kindly joined us. Writing about Joanette's cupcakes makes my mouth water. I can't wait to savor the last one of the two she'd baked for me. When I have a kitchen again, I plan to make these! 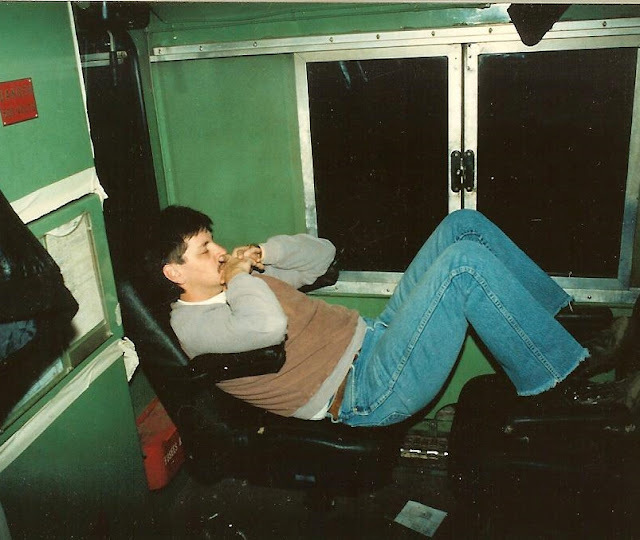 Tom asleep on the locomotive, early 90's, while deadheading (being transported to another location while not on duty). Technology story on last year's post shown here.